Each year in America there are between 6.5 million and 7 million Motor Vehicle Accidents or (MVA’s) that affect many. Of those accidents, about three million involve some form of bodily injury. About two thirds of these injuries, while not debilitating, are permanent. When you are rear-ended your body is driven out from under your head. Although there is a great deal of soft tissue stretching that occurs in the soft tissues (LIGAMENTS, TENDONS, MUSCLES, and FASCIA), as your body travels forward at a significantly higher velocity than your head; at a certain point, these “soft tissues” cannot stretch anymore. This is the first point at which microscopic tissue tearing occurs. This is the beginning of the injury process. The head is now accelerating forward faster than the entire body. When the body comes to a stop (i.e. your vehicle slams into whatever is in front of it), the head will continue to travel forward. This is actually where the term “whiplash” comes from, and where it occurs. It’s exactly the principle of physics that results in the tip of a bullwhip to ‘crack’ as it breaks the sound barrier. If this type of ‘whipping’ motion occurs in the neck, it can result in a great deal of soft tissue damage and subsequent formation of fibrosis and scar tissue. Additionally, it may lead to a great deal of occult (hidden) brain and nerve system trauma. An experimental study of motor/sensory function and psychological distress in subjects with acute whiplash injury. Characterizing acute whiplash injuries in terms of motor/sensory systems dysfunction and psychological distress. This involves comparison of subjects with higher and lesser levels of pain and disability. Motor system dysfunction, sensory hypersensitivity, and psychological distress are present in chronic whiplash associated disorders (WAD), but little is known of such factors in the acute stage of injury. As higher levels of pain and disability in acute WAD are accepted as signs of poor outcome, further characterization of this group from those with lesser symptoms is important. Motor function (cervical range of movement [ROM], joint position error [JPE]; activity of the superficial neck flexors [EMG] during a test of cranio-cervical flexion), quantitative sensory testing (pressure, thermal pain thresholds, and responses to the brachial plexus provocation test), and psychological distress (GHQ-28, TAMPA, IES) were measured in 80 whiplash subjects (WAD II or III) within 1 month of injury, as were 20 control subjects. Three subgroups were identified in the cohort using cluster analysis based on the Neck Disability Index: those with mild, moderate, or severe pain and disability. All whiplash groups demonstrated decreased ROM and increased EMG compared with the controls (all P < 0.01). Only the moderate and severe groups demonstrated greater JPE and generalized hypersensitivity to all sensory tests (all P < 0.01). The three whiplash subgroups demonstrated evidence of psychological distress, although this was greater in the moderate and severe groups. Measures of psychological distress did not impact on between group differences in motor or sensory tests. Acute whiplash subjects with higher levels of pain and disability were distinguished by sensory hypersensitivity to a variety of stimuli, suggestive of central nervous system sensitization occurring soon after injury. These responses occurred independently of psychological distress. 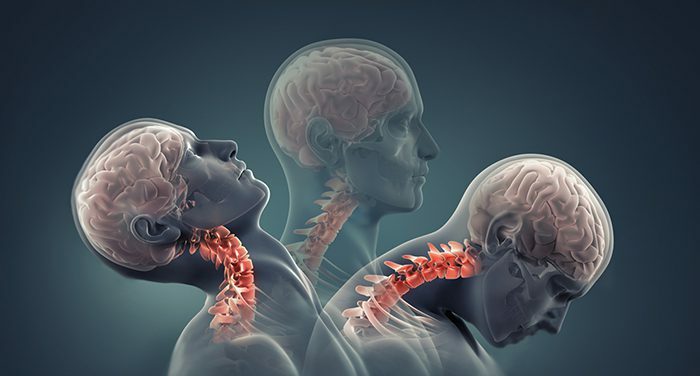 These findings may be important for the differential diagnosis of acute whiplash injury and could be one reason why those with higher initial pain and disability demonstrate a poorer outcome. Sterling M1, Jull G, Vicenzino B, Kenardy J.